Organisers of the 2012 Olympics in London have announced two new top-tier sponsorship opportunities for major UK firms who want to back the games. The London organising committee (LOCOG) already has six top sponsor categories: automotive, banking, utilities, telecoms, insurance, and oil and gas. But at an Olympics financing seminar in London, LOCOG commercial director Chris Townsend revealed that extra categories for airlines and sportswear had been created. He also said the first big-name sponsor would be unveiled by the end of next month. 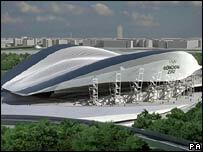 Sponsorship money from UK plc is one of the major sources of financing to meet the £2bn cost of staging the games. "We are on target to announce our first big partner by the end of March," Mr Townsend said at the Sport Business "Power of the Games" seminar at Arsenal's Emirates Stadium. He also said that 15 second-tier sponsors would be announced by the end of 2007. "We are two years ahead of where any other games have been at a comparable point in time," he said. The six top-tier sponsors can activate and start running their Olympic branding campaigns as soon as they sign deals with LOCOG, whereas second-tier sponsors will have to wait until after the 2008 games in Beijing before they can be associated with the famous five-ring symbol. There has been speculation that Lloyds TSB is ready to be announced as the banking partner in an £80m deal. But Mr Townsend said: "I cannot comment on speculation - but a big announcement is on the way." He added: "We are on schedule - we are where we want to be." Mr Townsend, a former head of marketing for Transport for London, said there was an "overwhelming importance" for UK corporate sponsorship of the games. "This is a once-in-a-lifetime opportunity for UK plc," he told the BBC. "It gives UK firms for the very first time access to the benefits of the Olympic games." He said those firms that did sign up would see a "remarkable return on their investment". "Companies become turbo-charged because of the partnership with the games," he said. "My discussions with UK firms are about helping them understand the true nature of 2012." Previous firms who had become national Olympic partners had found their businesses transformed, brands renewed, and workforce incentivised, he said. "It is not just about putting a logo on a product and increasing the number of eyeballs you get. "It is about bringing real benefits to customers, communities, colleagues, the company and the country." The LOCOG sponsorship schemes are separate from the International Olympic Committee's Top Partners programme, which has 10 big name sponsors including McDonald's, Coca-Cola, and Visa. In the next 12 months, the London commercial team also plans to launch its new branding and logo for the 2012 games.